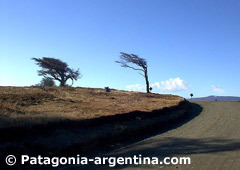 Home > National Parks > Monte León N.P. Patagonia has its first Sea National Park. This status is equivalent to that of the Coral wall in Australia or some areas in the Brazilian sea coastline. Here we tell you about the hidden treasures you will be able to make yours at this Park. A few Km. from Puerto Santa Cruz there is an Estancia, Monte León, that shelters an extraordinary reservation of flora and fauna as well as unmatchable sites in terms of archaeological and paleontological value. This Estancia belonged to the Braun family. In 1999, conscious of the value of the lands they were occupying, they sold it to an U.S. ecological foundation, “The Patagonia Land Trust”. They, in turn, contacted the Wildlife Foundation of Argentina to whom they ceded the old Estancia as a fideicommissum, a legal figure that enforces that the original objective of the donation is met. And the objective is to constitute an new National Park. The name Monte León comes from a rocky promontory located at the entrance of the road that leads to the coast, that resembles a lying feline, with its erected head. It is 35 Km. 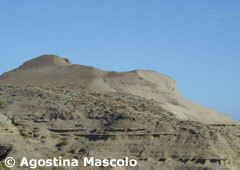 from Puerto Santa Cruz and 219 Km. from Río Gallegos. 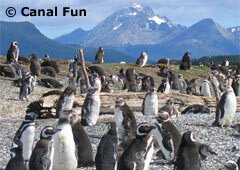 The typical fauna includes Sea Lions, lots of Magellan Penguins, ñandúes and guanacos. There is also a great assortment of sea birds, some of them considered unique like the Imperial or Black Necked Cormorants and Austral Seagulls. The concept behind a Marine National Park is that the protected water surface equals the one of the land. In total, this Park has an extension similar to that of the Iguazu Falls National Park, besides being the first in the country covering both a marine and coastal ecosystem. 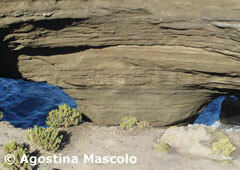 At the coast there are caves of a great archaeological and paleontological value. There is evidence (arrows, and oyster remainders) that confirms the primitive Tehuelches lived there. Among all the caves, one gets the spotlight: it is almost 40 meters deep and 30 meters wide, with two exits. The beaches present canyons, cliffs and rocky sectors, perfect to enjoy a memorable sea journey (in summer of course) when the tide is low. But the future tourists will not only be able to visit the beach and admire all the flora and fauna in this unique environment, but they will also have at their disposal the antique Estancia, a traditional wool manufacturing establishment. All the aboriginal testimonies, along with remainders of wrecks and some local battles that took place the very first days of the white colonization, will be displayed there.